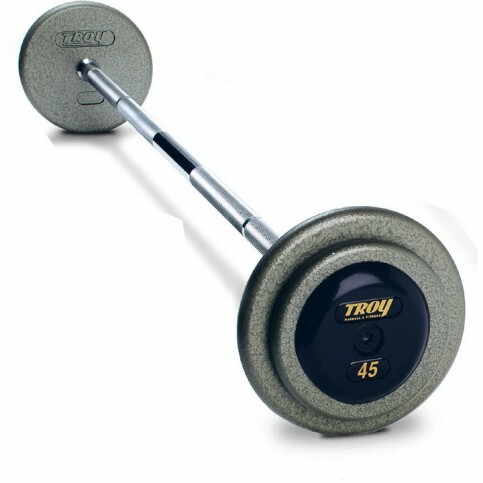 Build and strengthened you upper body with the Troy Pro Style Barbells Gray -120-130lbs set. Troy fixed barbells are custom assembled at the factory to ensure they meet the standards required in the heavy commercial atmosphere. All of Troy's pro-style barbells use solid steel bolt design which is bigger longer and stronger than the competition. These barbells feature special deep set knurling for functional performance. The rubber end caps include the Troy name and numbers for easy identification. Troy Pro Style Barbells Gray 120-130lbs HFB-120-130-R are engineered to offer unmatched aesthetics and durability Troy is the premium institutional & commercial grade free-weight product. Whether you're looking to outfit a gym, apartment, school or home, Troy delivers stylish durability and value with three distinct product lines each uniquely engineered for your specific application. Every TROY Barbell item is manufactured at the highest quality. Troy is committed to product research and development to ensure that only the highest-grade materials are incorporated, resulting in the best weight and fitness products in the industry. Call 1-800-875-9145 to speak with one of our fitness agents with any questions you may have about our barbells or Order your Troy Pro Style Barbells Gray 120-130lbs HFB-120-130-R from FitnessZone.com today! Rubber end caps. Troy Pro Style straight bars by Troy Barbell are all pre-assembled to meet the standards required for any commercial application. All of our Pro Style barbells use a solid steel bolt design, and are the strongest most durable barbell of this type in the industry. The rubber encased end caps include the TROY name and numbers for easy identification. 10 year warranty against breakage. Order your Troy Pro Style Barbells Gray 120-130lbs HFB-0120-130-R from FitnessZone.com today!